Ever have one of those years, or let’s be honest, decades days where you sit down at your computer, grab your mouse…then stare at your screen and realize you don’t have the slightest idea what you’re supposed to be doing? Yes. Hi. We should have cookies and milk together sometime, because I’m really not sure what I’m doing here at the moment. Aside from eating these really killer Kahlua brownies, that is (because really, what better way to get in your booze fix and still look like a respectable human being than through a forkful of chocolate?). Sorry if this sounds completely scatterbrained. It is. I haven’t had full use of my brain cells since maybe the summer solstice, though I’m sure the two events are unrelated. Or at least, I’m pretty sure. 85% sure. 2. Not having my pictures on hand, I completely forgot what recipe I was supposed to post. Think black hole status. Szchooop. (That’s the sound of a black hole doing black holey…stuff.) Nada. In other news, I’m making progress in my Productibaking for Part I’s (i.e. qualifying exams) and admittedly unable to keep my oven on at the same pace as my reading, which I suppose is a good thing. However, if anyone would like to volunteer to edit my photos, write my blog posts for me, and spread them to all your BFFL’s and Tastespotting and Foodgawker and linky parties, I would be a very productive baker, I’m sure. Again, 85%. And I’m also accepting Time-turners in lieu of labor hours. On that note, for those of you with food blogs, I’m truly sorry that I haven’t been able to keep up with most of them lately. My reading load really can’t justify more than about 5 seconds of actual procrastination every day (which usually involves blinking really long five times before getting back to work), so I’ll be kind of AWOL from blog-reading until I finish studying (hopefully) in November. That being said…I also wanted to let you know that I also truly appreciate all of you who continue to drop by and take the time to leave your kind wishes! Studying is tough, and attempting to study while working one full-time and another part-time is taking some adjustment. But seriously, if I didn’t love every moment of what I did, I wouldn’t be enjoying this summer as much as I already am! So leave a note if you have time, and in the meantime, take care! You might even go and give these extra fudgy, boozed-up coffee-flavored brownies a try while you have the time. I trust we’ll see each other soon enough. Back to the books–and hopefully, back to the oven soon. I’ll be posting a recipe for these amaayyyzing cookie butter snickerdoodles soon, so look forward to it. Cheerios! Preheat oven to 350 degrees F. Line a 9×9-inch baking pan with lightly greased foil and set aside. Place butter and chocolate chips in a microwave-safe bowl. Heat on high at 20-second intervals, stirring between each interval until chocolate and butter are completely melted, and smooth. Set aside and allow to cool while proceeding to next step. Beat together brown sugar and eggs. Stir in 1/2 cup Kahlua. Mix in chocolate mixture until completely smooth. Mix in flour, baking powder, and salt, until just incorporated. Pour batter into prepared pan and bake in preheated oven for 40-45 minutes, or until toothpick inserted in center comes out with only a few crumbs clinging to it. Remove brownies from oven and prick all over with toothpick. Immediately brush with (up to) 1/4 cup Kahlua–because really, who doesn’t want more Kahlua? Frost with Kahlua frosting (below) if desired. And really, you shouldn’t deny that desire (when should you ever? ), because it’s really, really good. In a medium bowl, mix together butter and Kahlua. Beat in powdered sugar, adding more or less as necessary for a frosting that is thick enough to spread and hold its shape. 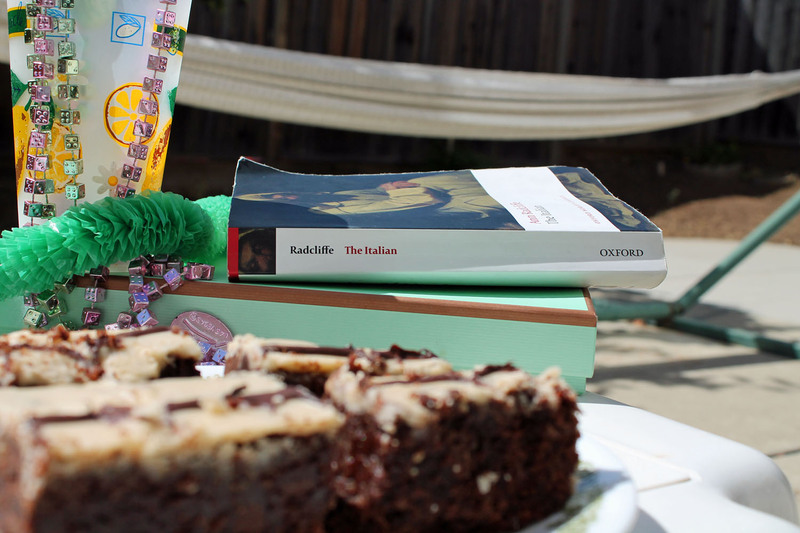 Frost on Kahlua brownies–or anything that needs boozing up. Thank you so much for this recipe! I can’t wait to make it. They look so moist and chocolaty. Good luck with your studying. I don’t know how you even had time to post this! You’re so sweet, Shari! The first thing I’m doing after these dreaded quals is visiting your blog to return the favor. 😉 Thanks for the bright wishes! 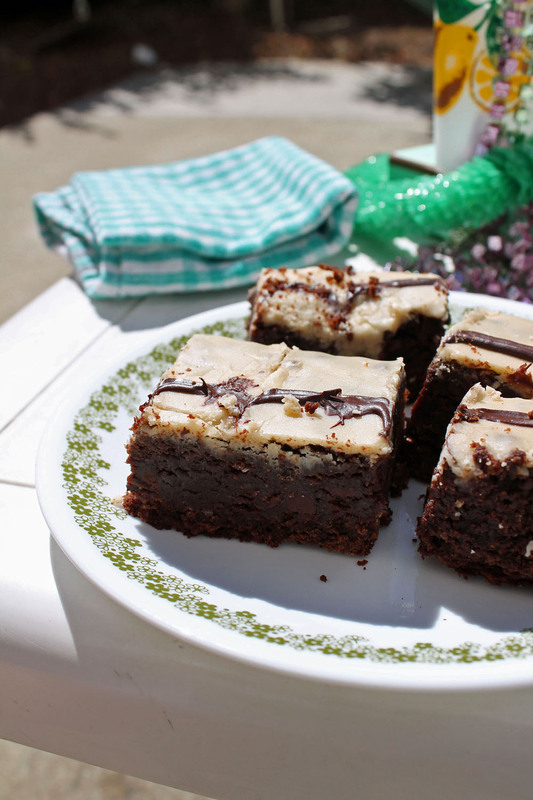 Oh my…I’m loving your Kahlua brownies! I’m staring at them and don’t know what I’m doing either because I wanted one so badly! Should I simply reach into the screen and grab one? Wish I can do that! Oh well, guess I have to bake a batch first thing in the morning!!! Oh, I hope you did/do get a chance–I have a feeling these would be even better in the *morning*… 😀 Thanks, Amy, and let me know how you like them! I’ve never read Ann Radcliffe, probably because I’ve never been a fan of Gothic fiction. Is she worth reading? I do know that these brownies are worth making! Really nice. Don’t worry about visiting blogs while you’re studying – that’s kinda important, you know. 😉 Anyway, thanks for this. I am totally not going to disagree with that statement! 🙂 Thanks, Sally. i am making these today! cold, snowy, gloomy day in northern NJ, perfect for baking! hope you are well, and school is going swimmingly…altho maybe skating-ly would be better in this weather. Thanks so much, Dawn! Luckily for us, it’s only “cold”–meaning it’s 60 degrees and sunny out…keep warm with that oven on, and I hope you enjoy those warm brownies!